Global Exhibition Day #GED17 is celebrated all over the world, but why are exhibitions so important? Submitted 1 year 10 months ago by FeedsFloor. Face-to-face marketing and sales still constitutes one of the most effective channels, and quite often the channel that companies use the most money on. Exhibitions therefore still deliver over 260 million visitors a year all over the world. Exhibitions are not just helping to stimulate the market within a certain industry; exhibitions can also stimulate economic growth and the development of infrastructure in countries around the world. The global exhibition industry is therefore valued at USD 55 billion. Exhibitions bring industries together and with 4.4 million companies that exhibit every year, exhibitions and trade shows are seen as a key component when companies and businesses are going international. It is UFI, The Global Association of the Exhibition Industry, which is behind the initiative of celebrating the exhibition industry and the people who work in it all over the world. It is being celebrated with physical meetings, events and online on social media. If you like to follow the activities just follow #GED17 on Facebook, Twitter, Instagram and LinkedIn. FeedsFloor, a Danish tech company that provides an online EXPO platform, will also be celebrating Global Exhibition Day. It is being celebrated on all our social media channels with focus on the importance of exhibitions for companies that would like to grow internationally and locally. Even though the core product of exhibitions still is face-to-face meetings, the use of technology within the exhibition industry is growing rapidly. Technology helps with everything from project management, ticketing systems, scanning of visitor badges to custom event apps. 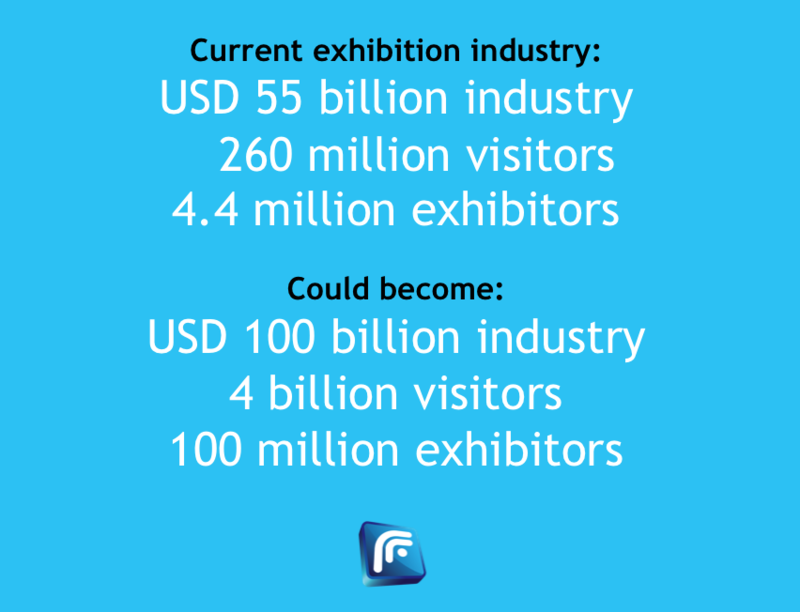 FeedsFloor believes that with the help of the right technology the exhibition industry could more than double in size over the coming years. By moving into the more digital channels, smaller companies will also have a chance to participate in the community that surrounds an exhibition, and visitors not being able to attend an exhibition on the other side of the world, can still be able to connect and engage with exhibitors. Technology therefore opens up for a great number of new ways to enhance and boost the exhibition industry to a new level. FeedsFloor helps physical exhibition organizers by offering an online value added solution that benefits both organizers, exhibitors and visitors. At FeedsFloor, you can organize an online EXPO for free during or after the physical EXPO, promote your exhibitors and their products in an easy and simple way, and visitors can chat 1-to-1 with your exhibitors (for max 14 days) after the physical exhibition. In this way visitors have a chance to chat with specific knowledgeable people from the company on the chat e.g. a director, that is not normally standing at an EXPO booth, or they can ask follow up questions and interact in an easy way.